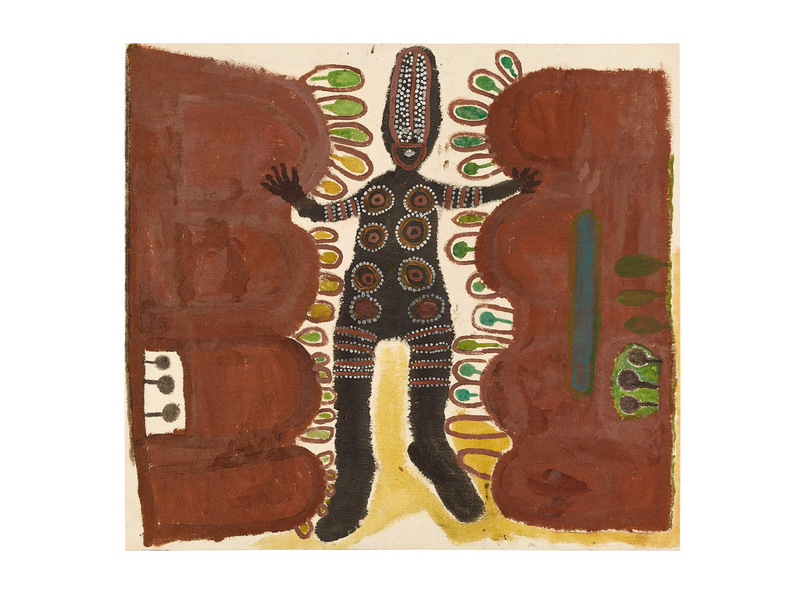 In a first for an Australian public institution, a most significant collection of works by the Kimberley artist Jarinyanu David Downs (c.1920-1995) - 23 pieces in all - has been acquired by the Museum and Art Gallery of the Northern Territory. This pioneering artist consistently visualised ancestral beings in human form, and his innovative, figurative style set him apart from other Kimberley and Western Desert artists. Eleven of the 23 pieces are the first contemporary works to feature and honour the Desert ancestral figure Kurtal - The Rainmaker, and make the connection between rain and the replenishment of life. Kurtal can be found at the jila (permanent waterhole) of the same name in the eastern region of the Great Sandy Desert of Western Australia. It was here that Jarinyanu and his brothers learnt to perform ceremony to make rain before relocating to Fitzroy Crossing in Western Australia in the 1940s. This collection, spanning the artist's career as an artist from 1982-1995, captures a significant historical period when very few artists were producing works in the Kimberley. Significantly, he was one of the first of his artistic peers to shift from artefacts to paintings. The collection constitutes two parts: Part one is a historic collection of the first known paintings on canvas by Downs, collected by the late Lord McAlpine, and part two is a series of later works commissioned by the visionary Adelaide dealer and collector, Duncan Kentish. Jarinyanu, creative, forceful and entrepreneurial, was an artistic mentor to a generation of central Kimberley artists including his rainmaking brother the late Nyilpirr Spider Snell, Pajaju Peter Skipper and Ngarralja Tommy May. 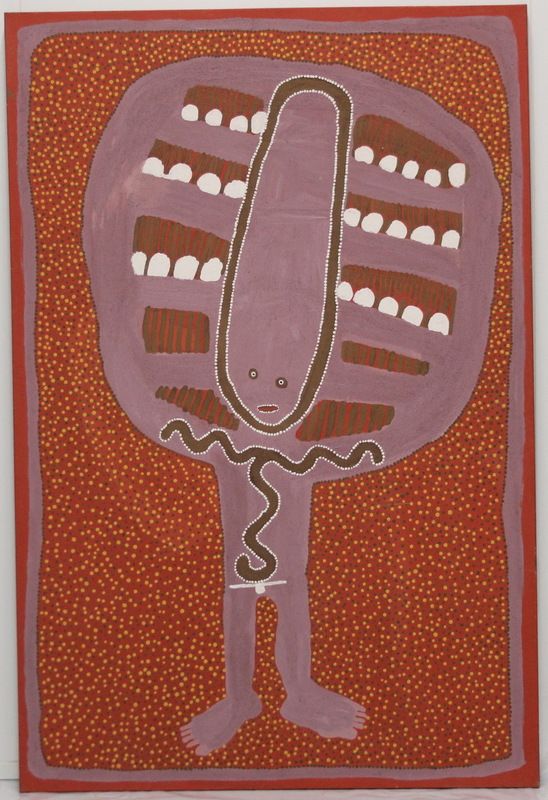 But it was Jarinyanu's collaboration with Duncan Kentish, who came to Fitzroy Crossing in 1986 in search of him, that led to a major shift in the scale, materials and quality of work. Kentish oversaw Jarinyanu’s inclusion in more than nine international exhibitions and mounted a number of important solo shows, most notably at Bonython-Meadmore Gallery, Sydney (1988), Chapman Gallery, Canberra (1991), and Ray Hughes, Sydney (1995). In 2016, following Kentish’s death, Greer Adams Fine Art and the Downs's family held the first solo show of the artist in over 20 years. In one of Kentish's catalogues, he tells the story of Downs, wearing both his traditional rites and serious Christian hats, demanding to know where Kentish's Country was. The dealer took him to his birthplace of Mt Gambier, and, of course, displayed the Blue Lake. Downs immediately recognised that here lay Australia's Christian connection, for Jesus Christ had risen from the waters here before flying across to Bethlehem and That birth. Jarinyanu’s son Paddy Downs commented: "These paintings ending up in NT for all the mob to see is important. It's what Wabura [Jarinyanu] always wanted. He wanted them to educate people. He would be happy. The old people will remember them, come visit them. This is our history. Very important paintings”. Luke Scholes, Curator, Aboriginal Art at the MAGNT enthused: ‘This startling collection of twenty-three paintings is of unique cultural, historical and artistic significance and will allow MAGNT to bring greater attention to our collection of items from the Kimberley region, which is an important geographic area of MAGNT’s collecting foci”. Funding for this purchase came from both philanthropy and the little-known National Cultural Heritage Account which helps Australian public cultural organisations to buy significant objects that they could not otherwise afford. A total of $500,000 is available each year and, in 2018, funding was provided, inter alia, for a Thylacine pelt in complete condition at the National Museum of Australia, a 19th century Aboriginal shield for the Queensland Art Gallery, and the Downs collection for MAGNT in June 2018. Perhaps it's not coincidental that the Arts Department's advisory committee for this Account includes the redoubtable Margie West AM, Emeritus Curator of Aboriginal Art and Material Culture, Museum and Art Gallery of the Northern Territory. The only oddity in this delightfully positive tale is that the Art Gallery of WA was just about to hold its current 'Desert River Sea' exhibition of Kimberley art as this collection was being made available, but they've ended up in the NT! Luke Scholes tells me that the first appearance of a work from this collection will be in May when MAGNT reveals a number of new acquisitions of Aboriginal art in an exhibition called 'Momentum'.